"A different approach to steel sculpture" is what one writer called this art on the Kansas hill. Unique diverse methods of construction use metal bar, plate, pipe, and found pieces. Not all the pieces have a literary reference, but it is a theme of many of the pieces and scenes. I like "a different approach" better than "original" - the word "original" is so overused in the art world. The main purpose of my sculptures is to give people pleasure. Steel for me was the metal for today's sculptures using my representational, expressional, impressionistic, or abstract styles. The maintenance of properly built steel sculptures is probably less than most other sculptural materials that have to be cared for once or twice a year. To last steel should not be set directly in the ground and should not have pockets in the structure that will hold water. As Shakespeare wrote: water is a "sore decayer." I have tried to often create designs that can be sandblasted and painted on all surfaces without any closed areas. The flat plate pieces start from the center and anything that might overlap another area is bolted on. The access of all surfaces in the open steel bar designs is also assured. What I have tried to do is to find new ways to use steel in sculpture. I wish I were young enough to explore more possibilities. I have reached the point where I am selling the right to copy, to loan maquettes or license photographs of my designs. And in recent years I haven’t been able to do much more than small pieces – birds, bouquets, etc. 2. A sales gallery for the work of local sculptors. 4. A sculptural tribute to “highly literate” English majors. Feel free to send email using the link above, or write Sculpture Hill, 10401 S.W. Boyer Road, Augusta, KS 67010. 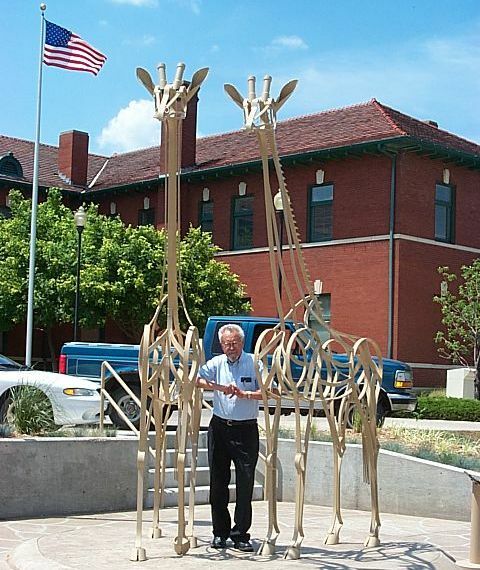 Frank Jensen and "Sentinels of the Savanna"